This is one of those camera in hand at the right time type of photos. The weather changed from cool to hot in a matter of one day, and then returned to mild. These are the perfect conditions for sun halos and sun dogs. 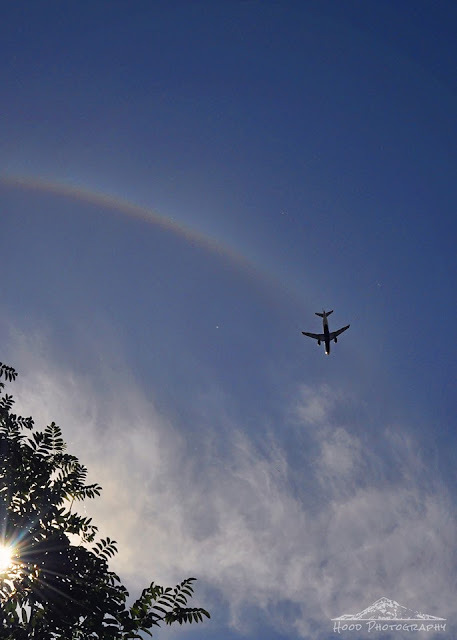 This sun halo was captured right over my house just as a plane flew into its circular path. That is perfect. Did you know the plane was perfectly aligned before you downloaded? Spectacular capture --- your stars were aligned. Oh, the perfect moment indeed and what a lovely capture!! Yep, your stars were perfectly aligned indeed!! Happy July 4!! Enjoy! Well spotted - thank you for sharing. Yes, perfect timing and great photo! I love this! Way to go! Wow, really just the right time for an impressive foto!